You’re looking for a pair of new shoes on Zappos or a knife set on Amazon and then suddenly, you start seeing ads all over the place for those same products. This is retargeting in action. Businesses that you have expressed interest in by visiting their site are trying to get you to come back so that they can complete the sale. But how does this work for recruiters? Hiring a recruiter isn’t exactly the same as making a $50 impulse buy. 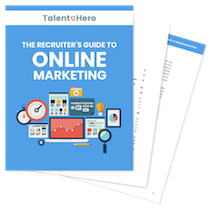 Even so, there’s a lot you can do as a recruiter to use retargeting to win new business. Why bother with retargeting as a recruiter? AdRoll says that only 2% of visitors convert the first time they land on your site. In the case of recruiters, that number is likely even lower. That means that at least 98% read your blog post or see your service offering and forget about you. How can you get back in front of them after they’re gone? Retargeting! Retargeting, also sometimes called remarketing, allows you to show ads to people who visited your site but didn’t sign up for your mailing list or get in touch. The goal is to drive people back to your site and get another chance to “pitch” them. The beauty of retargeting is that you know that the people who see the ads are much more interested than your average lead, making the ads highly effective. In fact, studies show that your retargeted audience is 3x more likely to click the ad than a cold lead. It’s actually quite simple but the process does vary by platform. If you want to advertise on Google’s display network, you need to add a remarketing tag to your website. On Facebook, it’s called a pixel and on LinkedIn, it’s called the LinkedIn Insight Tag. All of these are essentially synonyms for a small snippet of code that you add to every page on your site. Once the code is added, the advertising platform can track who visited the page and then display ads for your business to those visitors as they visit other sites that are a part of the advertising platform’s network. After the code is added, you launch your campaign. The process for each platform is different but there are a few common considerations before you get started. Does your site have the traffic volume to support retargeting? Ad platforms will not let you re-target visitors until the number of people in your retargeting audience crosses a certain threshold. The threshold is different depending on the platform but typically, you’ll need a thousand visitors per day for retargeting to be a viable option. What type of ad are you going to use? If you want to use a text ad, you can get started immediately but if you want to use an image ad, you will need to figure out the proper dimensions for your ad platform and have the ad designed by a professional. A good cheap option is Fiverr. How do you want to define your retargeting audience? Do you want to target every person who visits your site or only people who visit certain pages? Does a visitor need to spend a minimum time on the site to quality for retargeting? Each platform offers different options for customizing your audience so be certain to explore them thoroughly. For how long do you want to target visitors? After a person visits your site, most ad platforms will let you retarget them for over a year but you’re likely going to start annoying people after about a month. Consider 30 to 60 days as the optimal timeframe. So you’ve got them back to your site. Now what? Your retargeting campaign is underway and you’ve managed to get a visitor back to your site. What do you do next? Keep one thought in mind – don’t let them get away again. If a person has clicked on a retargeting ad, you can be reasonably sure at this point that they are a warm lead for your business. This means that you should have a much greater chance of getting their contact information than you would a regular visitor to your site. How should you go about getting that information? A targeted landing with a high value offer. In plain English, you should be directing retargeted visitors to a page on your site that gives them something of value (a whitepaper or detailed case study) in exchange for their email address. On the Talent Hero Media site, you can see that the “Recruiter’s Guide to Online Marketing” page serves this purpose. Once you have their email address, you can begin an email marketing campaign and eventually contact them directly to pitch your services.